Hello everyone! I hope you’re well and you had a great weekend!!! How beautiful was the sunshine on Sunday? A complete contrast to today! I am currently eating some nourishing parsnip and celeriac soup but I started my day with this beautiful smoothie blend. When the weather is cold, our skin can take a bit of a battering. Going from blasting winds to central heating can play havoc with the epidermis but if we help maintain a healthy and thriving gut, we can help support the skin from the inside. I like to take probiotics throughout the year but even more so when the mercury plummets. Adding a smoothie to your morning routine will get you off on the right foot and it’ll keep you firing until lunchtime! 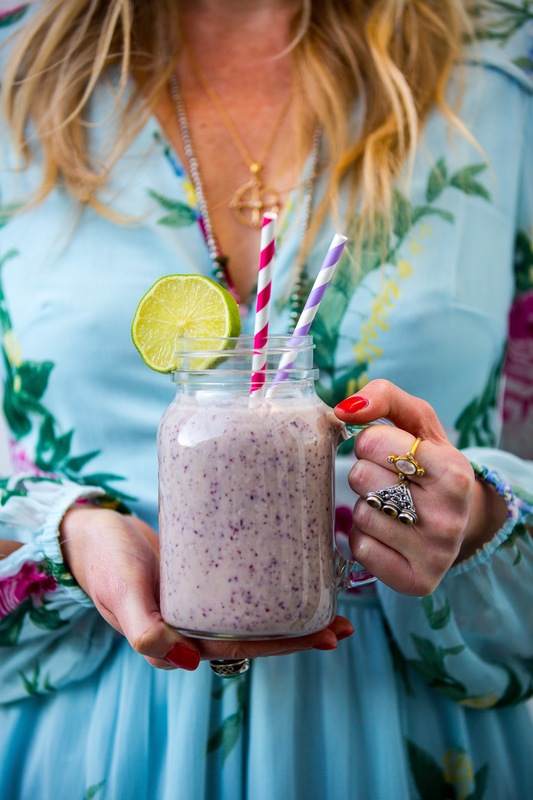 Recipe: 1 x cup of frozen blueberries, 1 x ripe banana, 3 x tbsp of coconut nectar, half a pod of vanilla seeds, 100g of almonds, 300ml of coconut water…..Blend and serve!